Earlier this week, Germany’s central bank, the Bundesbank, announced it would commence repatriating its vast offshore gold reserves, the second-largest stockpile in the world after that of the United States. Gold rose a bit after the news, but not much. It’s up about $20 for the week, still comfortably within medium-term trading range. Really, gold? We expected more… This is big news, after all. Officially, Germany claims 3,396 tons of the shiny yellow metal…though only a third of that total currently rests within its own borders. Almost half (45%) of the stash is vaulted some 80 feet beneath the streets of Lower Manhattan; roughly one tenth (11%) lies under the Banque de France. But now Buba wants it back. The Bundesbank will make a 300 ton withdrawal from its deposit in New York and a 374 ton, complete withdrawal from its holdings in France. Just to reiterate that last point…Germany will withdraw ALL of its gold currently held in France. All. (of.) Its. Gold. Now, what possible reason could the German government have for wanting to keep its hard asset currency close to home? Does it know something about the future of the euro that we don’t? Or the future of the dollar? Why has Buba fallen out with the Feds and the Frogs? 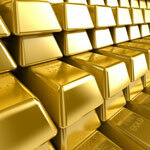 Gold stored in your home safe is not immediately available as collateral in case you need foreign currency. Take, for instance, the key role that the US dollar plays as a reserve currency in the global financial system. The gold held with the New York Fed can, in a crisis, be pledged with the Federal Reserve Bank as collateral against US dollar-denominated liquidity. There was never any doubt about the security of Germany’s gold. In future, we wish to continue to keep gold at international gold trading centres so that, when push comes to shove, we can have it available as a reserve asset as soon as possible. What happened to those “irrational fears,” Mr. Dobret? Did they suddenly become uncomfortably rational? It’s certainly true that pointy-headed academics were talking individuals out of their gold long before the Nixon snip…and that folksy billionaires have continued to do so since. Nevertheless, we have a feeling gold is about to get a whole lot more important. Again. Historically, gold has proved itself a reliable insurance against the corruptibility of men in positions of power…positions of power that routinely attract and promote corruptible men. Has anything really changed? Buba is grabbing her gold. Perhaps we should too.